And then, there are libraries. A couple of weeks ago, I found myself with 40 minutes to spare between the hotel breakfast and the start of a business meeting in downtown Boston. I was determined to see more of the city than just the inside of the hotel conference rooms, so I slung my laptop bag over my shoulder, chose a revolving door at random, and stepped out onto the sidewalk. I had no map and no desire to waste precious minutes bringing up a map app on my phone. This was Boston. Every square inch of this city is historic. Culturally rich. Vibrant. Alive with its own character, noisy with its own rhythm. I just began walking. Within a couple of blocks, I was already in love. A mother and young daughter jogged by in perfectly coordinated running togs (yes, togs), while business women navigated cobblestone-like brick surfaces in high heels and sharply-dressed men juggled their phones and coffee cups. Cars jostled for space and invented their own driving rules in ways that would impress Sicilian drivers. Centuries-old facades shouldered up against modern office buildings in companionable acceptance. And then a huge, modern building with interesting arched windows rose up beside me. 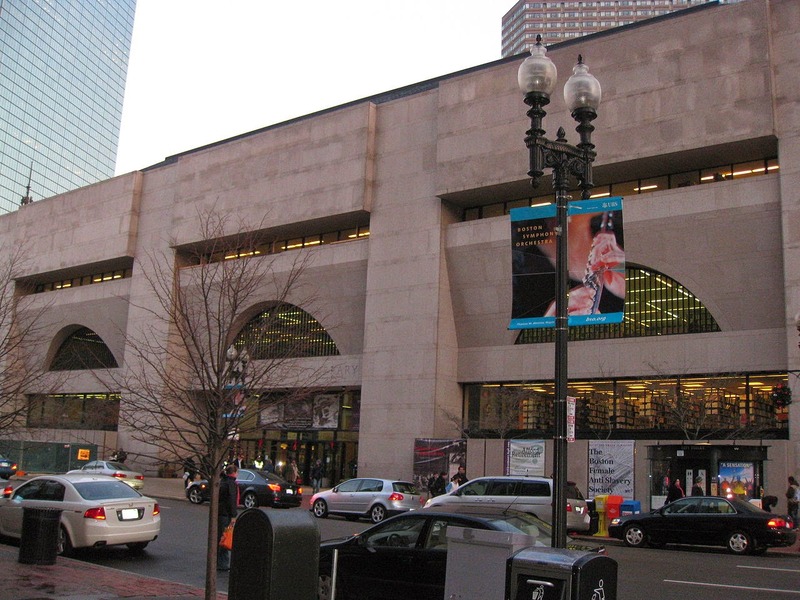 It took up a whole block, it seemed, and I looked for a sign: “Boston Public Library.” Perfect! 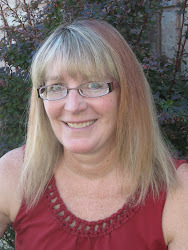 I walked through the glass doors and a bank of metal detectors, past a nondescript desk. Signs inside announced renovations. I stepped into the main room and discovered…well, okay, a library. A normal library. A low-ceilinged, white-walled, municipal library with shelves of DVDs crowding out the shelves of books. Frankly, it was all very ordinary. 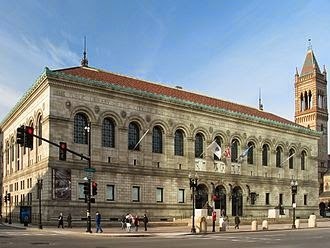 I wasn’t sure what I was expecting from the Boston Public Library (a bronze statue of Paul Revere greeting me, perhaps? ), but this wasn’t quite it. Shoulders slumping, I put my disappointment down to the “renovations” and trudged back out of the library onto the sunlit sidewalk and kept walking towards a promising-looking church on the next corner. As I reached the corner, however, I noticed that the modern building had given way to a more traditional-looking building. I read the inscription across the front and realized I had been wrong. 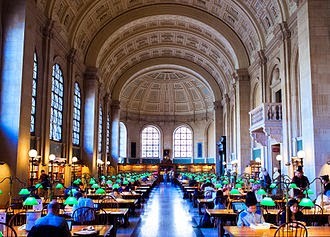 This was the Boston Public Library I’d expected to see. 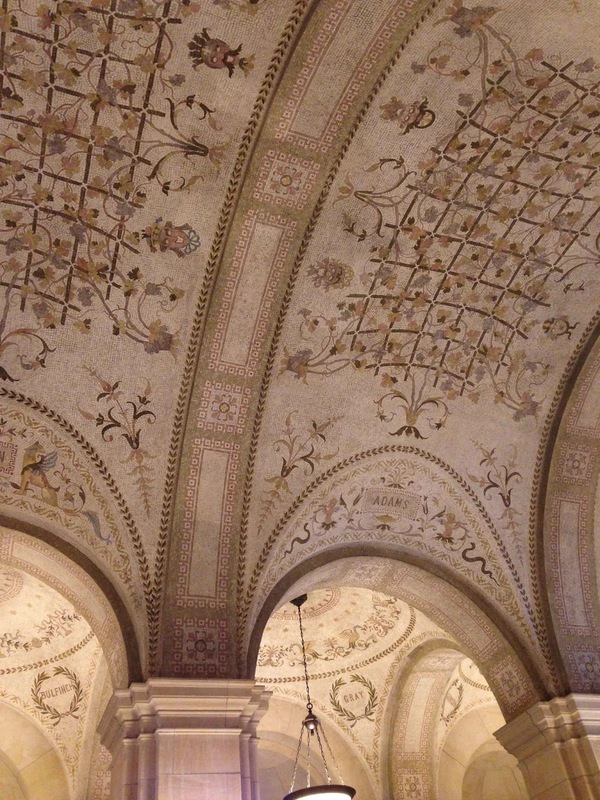 I walked up the broad steps into the granite building, through the ornate doors, and into a foyer with lovely mosaic ceilings arching over me. From there I stepped into the main hallway and caught my breath. 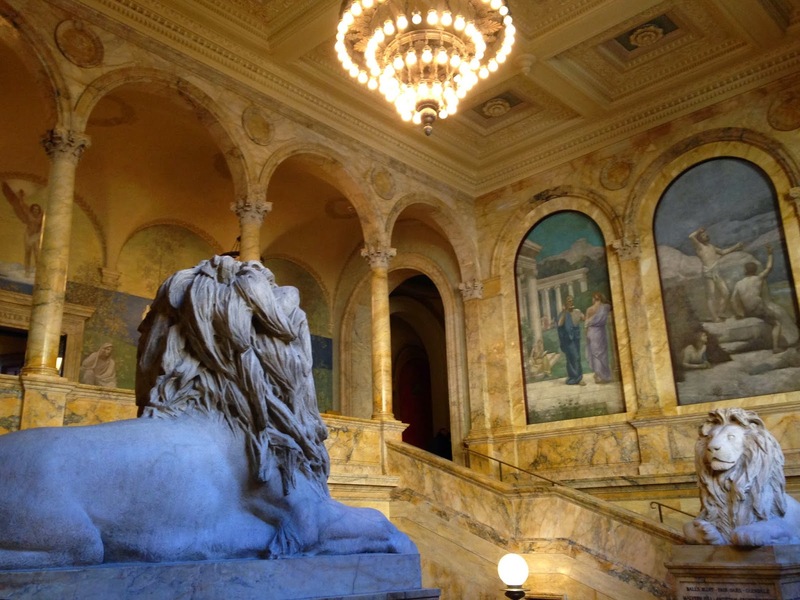 Ahead of me was the grand entrance stairway, with two huge marble lions standing guard beneath stunning murals. I passed a door to Bates Hall and froze. 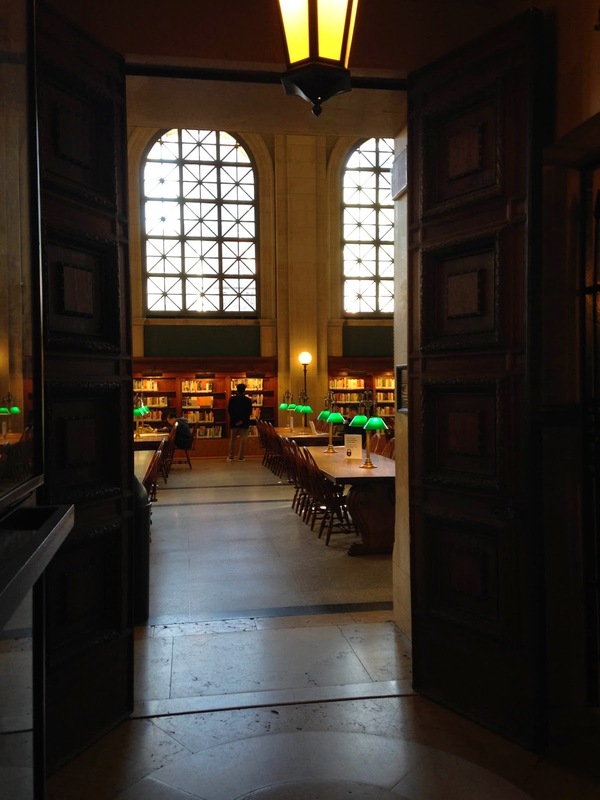 Through the door, I could see tall wooden shelves filled with books, and long tables with green reading lamps throwing a small circle of illumination at every seat. This was my classic image of what a library—a real, honest-to-goodness library—should look like. It’s probably been in a thousand movies, and that’s why it informs my mental image, but it stopped me in my tracks to see a figment of my imagination take physical shape. 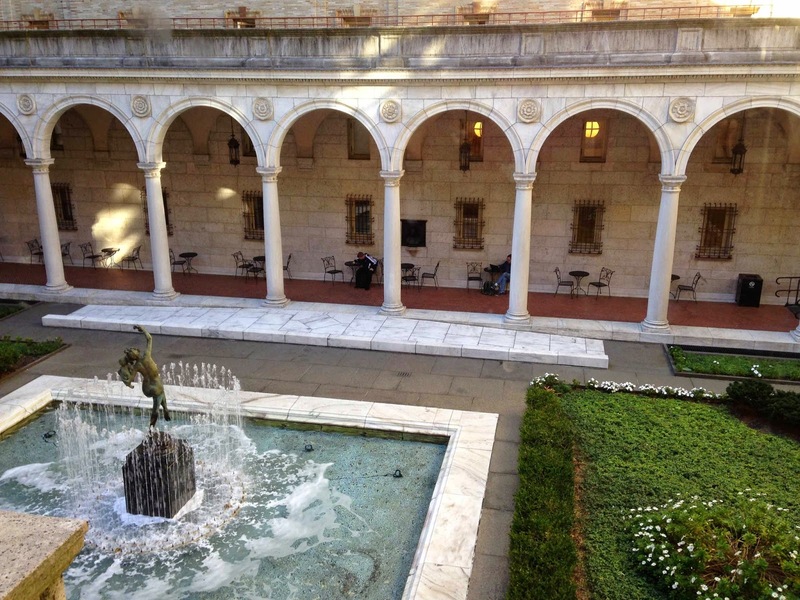 Out a window on the other side of the hall, a courtyard beckoned—an open-air columned gallery in the center of the building that brought to mind ancient Italian cloisters. A fountain splashed, and tiny café tables and chairs offered a perfect spot for some light reading. In just a few minutes, however, I was due back in the hotel conference room for my meeting, so I only had time for a handful of photos. And for standing perfectly still in the hallway, listening to footsteps ring off marble floors and high ceilings, breathing in the scent of books and old stone, and absorbing the faint whispers of all those ideas and dreams that have been infused into that building for nearly 120 years. All those stories. Both the written ones, and the human, living ones that have walked through those doors, paused in the turmoil of their lives and struggles, and lost themselves in the ideas pulsing from those written pages….All those stories. I only had a handful of minutes to walk through downtown Boston, but somehow I found the place I needed to be.